Gypsy Scholar: Next IS Battlefield: Europe? Lorenz Berger spent a week captured by a terrorist militia of the "Islamic State" (IS). He used to be a soldier and has long been in the Middle East as a freelance agent, so he is used to hardship, but he thought he was going to die. He escaped when the Syrian air force bombed the area where he was prisoner. In the confusion, he grabbed one of the guards' guns, shot the terrorists holding him, and escaped. Berger is now at home in a peaceful EU country, but he has come to realize that the war is following him home. Almost exactly one year ago, on June 29, 2014, the IS chief Abu Bakr al-Baghdadi announced the caliphate. He declared himself a successor to the Muslim prophet Muhammad and started organizing his own territory to form a government. He intended to rule over an Islamist dream empire with brutal punishments and slave markets. But there would be more coming - and there is. Some sources claim that the IS has followed a strategy of systematically smuggling Arab fighters into Europe. If so, the IS is expanding its war into Europe. This may seem illogical at first glance, but the basic principle of IS warfare is that the more enemies, the better. This is according to the doomsday theory of the IS: total war will bring humanity closer to the Last Day and Muslim martyrs closer to paradise. As recently as April this year, the Berlin Ex-rapper Deso Dogg, now fighting for the IS, threatened Europe in a video with attacks by "sleepers," terrorists who secretly prepare attacks under the guise of a normal life for years, ready at any time to perform on command. Such IS sleeper cells already exist in Europe, say some sources, and they are growing in number under the guise of refugees, say others. Three main routes are clear on which IS people might come to Europe. The first leads from Syria over the Bosphorus to Greece. The second route runs through the chaotic mini-states of former Yugoslavia. The third is the Bulgarian route. A fourth, frequently mentioned itinerary, from Libya across the Mediterranean to Italy, seems scarcely used. 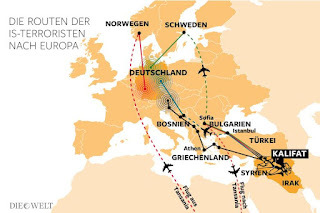 IS fighters are already everywhere in Europe, some experts claim, and sources say groups of them have been commanded to go to Germany, for example, and apply for political asylum there, and wait for further instructions from Syria. Once refugees receive political asylum, they are free to move and work in Germany. In the leadership of the IS, there are former officers of the Baathist regime of Saddam Hussein. Many of these were trained in the former Soviet bloc. After the Wall came down, many old communist spies went to the Middle East. According to some experts, the IS terrorist organization has inherited the Baathist and Communist expertise and knows how to conduct sensitive, dangerous paramilitary operations. The IS thus does not act like a guerrilla group, but as a state, for the secret services of the Eastern bloc were very professional and have trained the IS well. After Syria, then, the next big battle is Europe. Or so says Alfred Hackensberger, more or less, and he seems to be an expert, but I find the Communist angle somewhat speculative and likely exaggerated, though some links might be drawn from Communists to Baathists, and there definitely are former Baathists among the IS islamists. But Communists aside, what Hackensberger expects of the IS with respect to Europe is based partly upon the fact that the IS has opened fronts in Yemen, Egypt, Libya, Tunisia, and other places, so why not expect the IS to open a front in Europe? Finally, any mistakes in the text above are likely my own, for I've translated, paraphrased, summarized, omitted, and commented in preparing this for posting. In short, if anything is incorrect, blame me, not Hackensberger. Was Ringo the Greatest Beatle? Kenya play that country sound . . . Brother Shan Doing Good Things . . .
Big Jerks as Great Visionaries? Or Vice-Versa? Boasting and Boosting with Bruno!